Bytesprite is an Australian independent game development team, led by Liam Hunt and Sam Zeid. Our debut title BrambleLash is out September 13th on PC/Mac, and is on its way to Xbox One and PS4. We also work on serious games for health, research and training. Liam and Sam met at university, studying games programming and game design. After working together on a number of student projects and game jams, they graduated and went separate ways into contract work and employment. The mission: gather valuable experience and cold hard cash to pursue their own independent work in games. 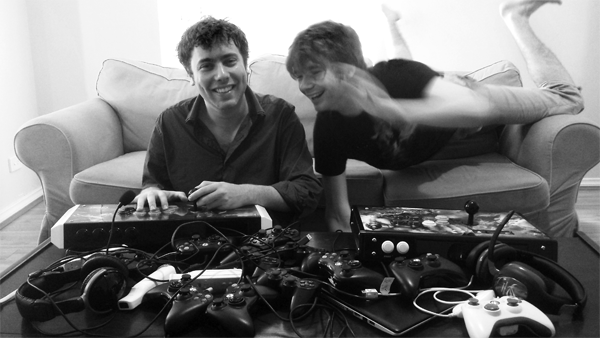 Fast forward 3 years to late 2014, where the duo came back together to form and run Bytesprite from their own shared game dev house, ready to chase that indie dream. As well as scrambling to learn the ins and outs of running a business and networking in a vast global industry, Bytesprite began working on their first game straight away; BrambleLash. The core idea for a co-operative tether based multiplayer game initially came from a Global Game Jam many years earlier, and so an initial gameplay prototype was up and running quickly. The team spent much of 2015 working on BrambleLash, taking it to numerous different local playtesting events. There was a massive learning curve in adapting to carrying out important tasks other than the creation of the game itself. After a long development cycle and many exhibitions at events such as the Perth Games Festival and PAX Australia, BrambleLash is scheduled to be released September 13th, 2017 on PC/Mac, with a console release on Xbox One / PS4 coming in 2018. There are far more images available for Bytesprite, but these are the ones we felt would be most useful to you. If you have specific requests, please do contact us!